Better than new. The EverLast™ Wall System replaces only the mold-damaged, mold-prone lower section of old basement walls, using totally waterproof materials. Does your basement have moldy drywall or moldy wood paneling? 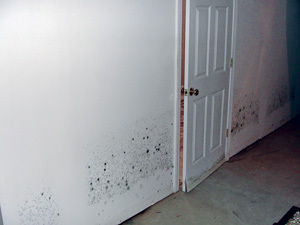 Are you dreading the mess and expense of restoring mold-damaged walls? Don’t worry. 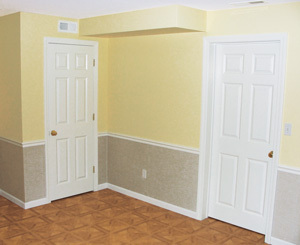 Total Basement Finishing has a fast, affordable fix for your problem. Many basements have moldy walls because they are mistakenly finished with paper-faced drywall and wood studs. These materials don’t attract mold upstairs, but in a humid or wet basement the damp cellulose provides an ideal mold habitat. If you can smell mold in your basement and see telltale splotchy deposits on wallboard, you know there’s a serious mold problem. 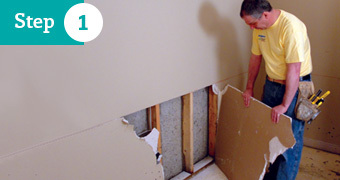 Instead of totally tearing out moldy basement walls, how about just removing and replacing the damaged lower section of the wall? This is what the EverLast™ Wall System allows you to do. Unlike an “above-grade” wall that’s framed with wood studs and finished with mold-prone drywall, an EverLast™ wall contains no mold food. Instead, EverLast™ walls are framed with steel studs, insulated with waterproof rigid foam, and finished with vinyl-faced cement board and PVC molding. Your EverLast™ Wall won’t ever be damaged by mold or moisture. Schedule a free estimate today to get started on EverLast™ Wall installation and a healthier, more comfortable basement environment! A new basement in just 4 steps! Waterproof the basement. With the bottom of the foundation wall exposed, we can install a perimeter drain and sump pump system to completely waterproof your basement. 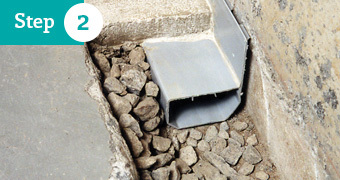 You can skip this step if your basement already has a French drain and sump pump system. 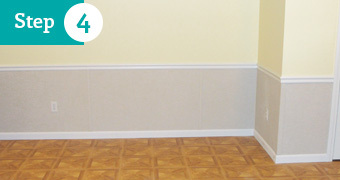 Finish the waterproof wainscot with vinyl-faced EverLast™ Wall Panels and PVC trim. After fastening the new EverLast™ Wall Panels to the steel studs, we install PVC plastic baseboard and chair rail molding. Cut and remove the bottom of the wall. Our technicians will make a horizontal cut at wainscot height, to remove the mold-damaged and mold-prone lower section of wood-framed basement walls. Moisture-damaged fiberglass insulation is also removed. Existing electrical wall outlets can usually remain in place. Install steel studs along the bottom of the wall. The framing for the new lower section of the wall is done completely with mold-proof, rust-resistant steel studs that extend from a steel bottom plate. Each stud is fastened to the upper section of an existing wood stud. As the steel studs are installed, we can also install rigid foam insulation to keep your basement more comfortable and more energy efficient. Standard drywall might not last a year in your basement without developing mold stains and moldy odor. But our EverLast™ Wall Panels have a 50-year warranty against moisture damage! EverLast™ Panels combine two popular interior colors — off-white and beige — in a lightly textured vinyl surface that repels stains and never requires paint. 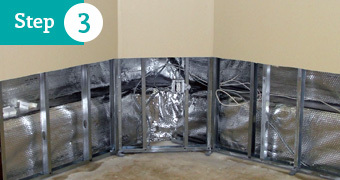 The EverLast™ Wall System is the best and last wall treatment your basement will ever need. Get Free Estimate! 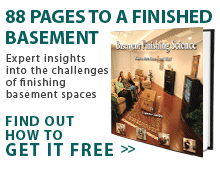 Do away with mold and moisture-damaged basement walls with our basement wall finishing solutions. Call or email today for a free basement inspection and wall restoration estimate from your local, certified Total Basement Finishing dealer.